Running Press Adult, 9780762413065, 144pp. 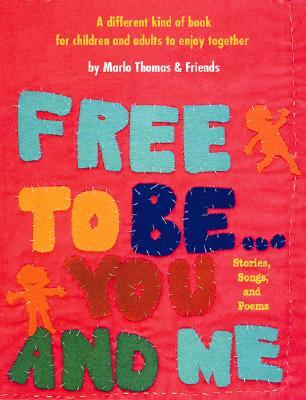 This is the book we all know and love by Marlo Thomas and her friends-brought to new life with brand new illustrations to captivate and inspire a new generation of readers on a journey of the heart. Whether you are opening Free to Be . . . You and Me for the first time or the one hundredth time you will be engaged and transformed by this newly beautifully illustrated compilation of inspirational stories, songs, and poems. The sentiments of thirty-five years ago are as relevant today as when this book was published. Celebrating individuality and challenging stereotypes empowers both children and adults with the freedom to be who they want to be and to have compassion and empathy for others who may be different. Working closely with Marlo and co-creator Carole Hart, Peter H. Reynolds, the New York Times Best Selling Children's Book Author/Illustrator, conjured his whimsical drawings throughout the book bringing a new sense of unity and warmth to the pages. You will find yourself marveling at the illustrations, nodding in agreement with the stories and poems, and singing the words to all the classic songs! It is wonderful that the thoughts, ideas, and emotions the creators envisioned so many years ago can still have a magical effect on children today. Marlo Thomas is an award-winning actress who burst onto the Hollywood scene and gained acclaim for her role as Ann Marie on That Girl, a part for which she earned a Golden Globe® and four Emmy® nominations. Thomas is also known for her numerous publications and recordings. She conceived the New York Times best-selling book Free to Be...You and Me, which inspired a CD recording (to which she contributed her vocal talents) and a stage show. More recently, she published Thanks & Giving Book and CD, The Right Words at the Right Time, and The Right Words at the Right Time Volume 2: Your Turn! She and her husband, talk-show host Phil Donahue, reside in New York City. Please visit her at www.marlo-thomas.com.